When you've decided that your home's impeccably decorated interior deserves an exterior to match, you'll find that one of your first tasks will be considering the various types of hardscape materials that are at your disposal. You'll review your options (and your budget), and then design your landscape plan around the hardscape features that you want to include. Wondering what "hardscape" means? Hardscape refers to the immovable parts of your home's exterior such as stone patios, wooden decks or gravel walkways, as opposed to trees, bushes and the like, which are semi-moveable (since they can be dug up and replanted). 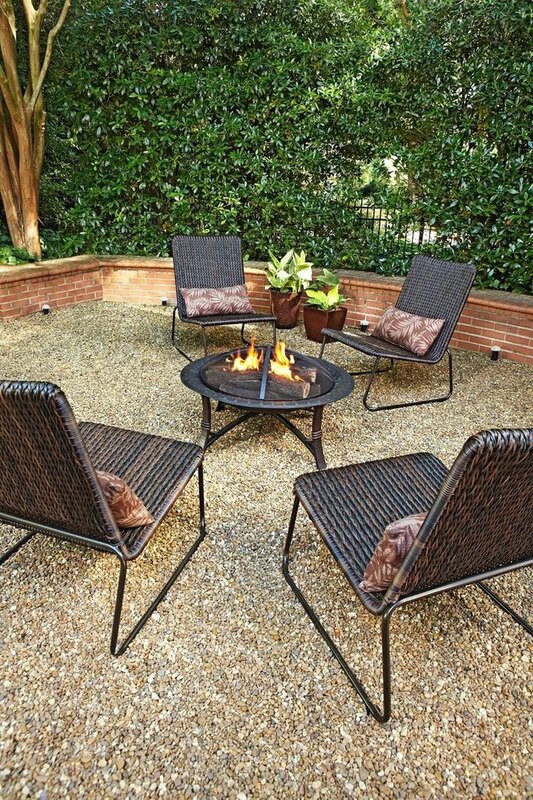 The essential types of hardscape material are: wood, faux-wood (composite decking material), concrete, brick, tile, loose stone (like pebbles, small rocks and gravel), solid stone (in slabs or tiles), and pavers, which are pre-cut shapes that form a paved area by fitting together like interlocking puzzle pieces (usually made of stone or concrete). 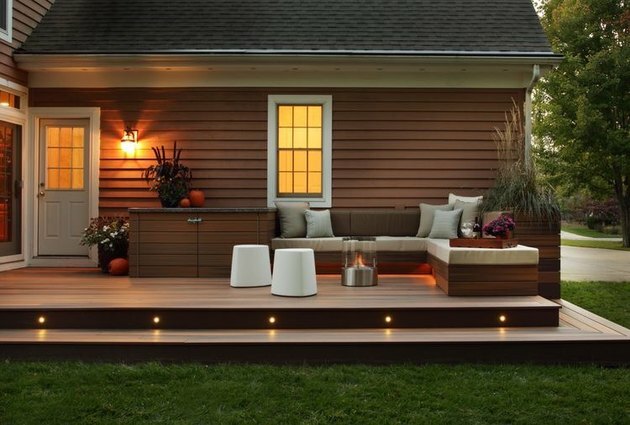 Wood is probably the first material that comes to mind when daydreaming of deck designs, so it's hardly surprising that it's the most popular hardscape material. However, it can require a fair amount of upkeep. A wood hardscape won't stand the test of time (or weather) as well as a solid stone or composite hardscape, so it's generally not the best material for walkways (which isn't to say that it can't be done). But a well-maintained wooden deck sure is nice to look at, and even nicer to lounge on. 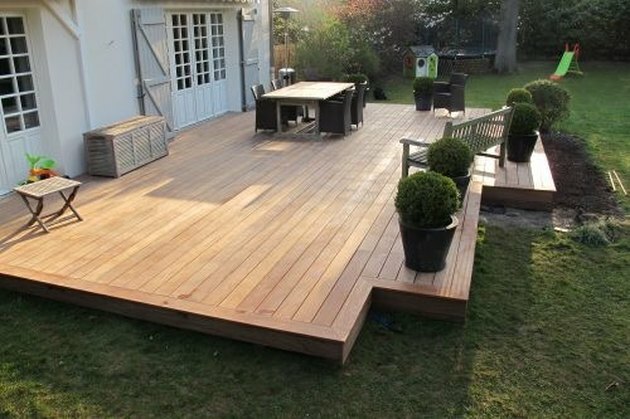 Restore, stain, and seal your wood deck when it starts looking a little worse for the wear. Faux-wood or composite hardscape material gives you all of the aesthetic appeal of a wooden surface, but without the vulnerability of natural wood, which can splinter, fade, and warp (from being left at the mercy of the elements and continuously trampled underfoot). While it does tend to have a much higher price point than its natural counterparts, the cost of composite can be worth it depending on your needs. Consider whether your hardscape feature will be experiencing occasional or high-traffic use, and also consider the climate that you're in. Removing ice from a wood deck isn't the most fun, and if wood isn't completely sealed, freezing conditions can lead to splintering, so composite could be the better hardscaping option for colder climates. Recent years have seen the rising trend of polished concrete floors indoors, but concrete is also a longtime staple of hardscape materials. So long, in fact, that you might not even notice the concrete hardscape that you have in your home anymore. If there's a walkway leading to your front (back, or side) door, if you have a garage or driveway, if your apartment building has a courtyard — there's a good chance of some concrete hardscaping in there. 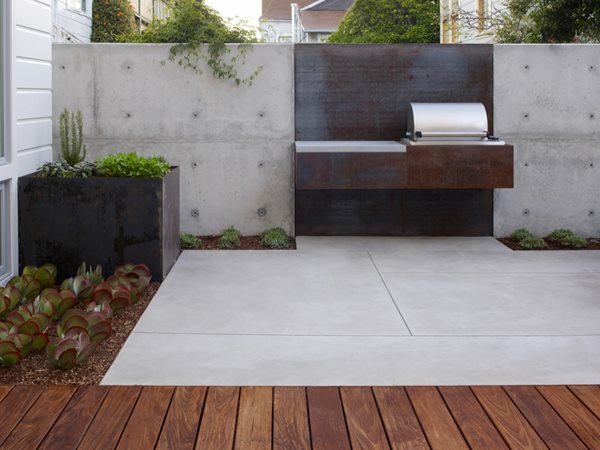 The material lends itself to the modern industrial look particularly well, which the patio pictured above pulls off nicely with polished concrete slabs (and unfinished concrete walls). Like wood, brick is a hardscape material with a classically pleasing aesthetic, which the herringbone brick patio in the photograph above captures perfectly. But brick and wood also have the unfortunate commonality of being naturally vulnerable to wear and tear from weather. As hardscape materials go, brick is actually among the softest thanks to its natural porosity, so the erosion caused by exposure to rain and snow is more pronounced in brick hardscaping than it is with less porous stone or concrete. 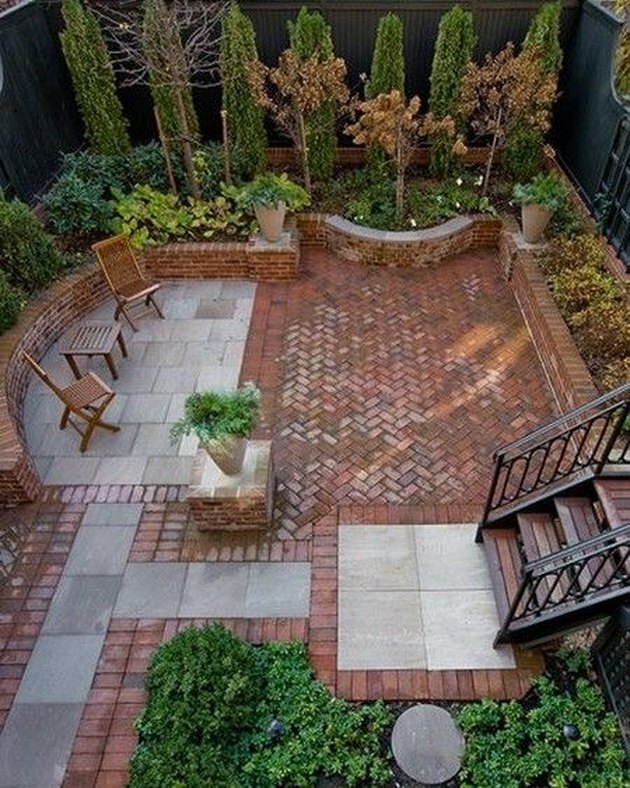 Try a DIY patio using brick pavers to get the brick patio look along with the resilience of concrete. We love the effect of tiling inside of our homes, and with tile hardscaping we can love it outside as well. 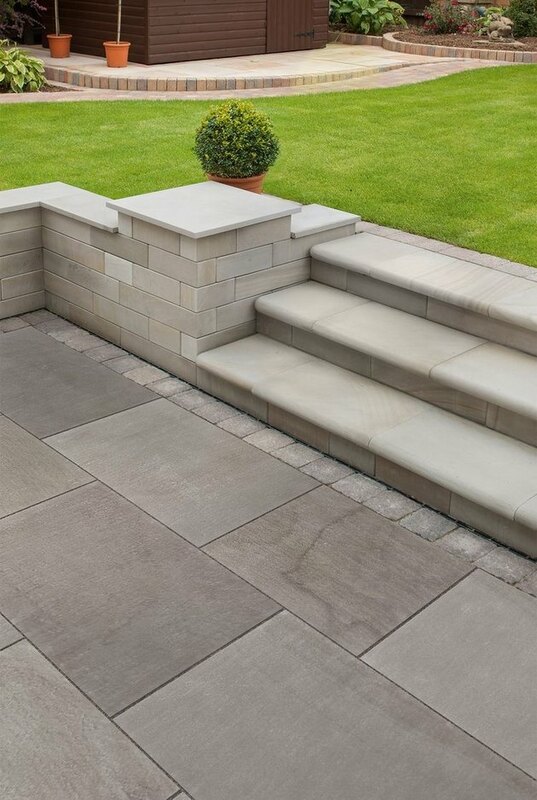 Certain types of tile are ideal for outdoor use, such as natural stone (like those pictured above) or concrete tiles. Tile is definitely on the pricier end of your hardscape material options, and with repairs and replacements best left to the professionals, the expense of maintaining a tile hardscape could start to add up. Be sure to protect your investment by sealing your outdoor tiles. 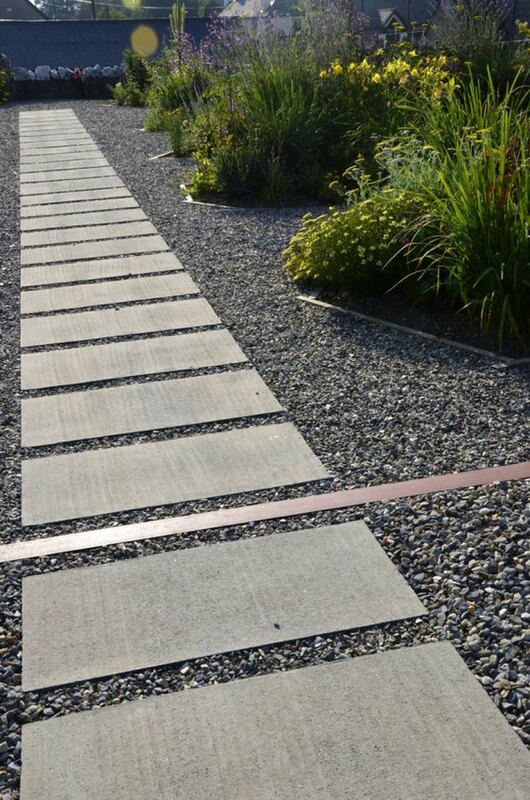 As a hardscape material, loose stone is most frequently associated with gravel paths and driveways, but it's actually an incredibly versatile element of exterior design. A loose stone hardscape feature can be an entirely paved patio (like the one above), a garden border, or a garden itself. Grab a sketchbook and explore the endless possibilities of landscape designs with rocks and gravel. Solid stone is a hardscape material that's picking up steam these days, with more hardscape designs incorporating large slabs of solid stone rather than (or in addition to) uniformly sized stone tiles or pavers. The granite flagstones pictured create a look similar to tiles and pavers but on a larger scale, and with the added dimension of sizing and tonal variations. The pavers vs. tiles debate could carry on for all eternity, but for our purposes the differentiation is pretty straightforward: pavers have been specifically designed for pavement, while tiles are designed for, well, tiling. You might describe pavers as tiles that are meant to be trod upon, and are subsequently sturdy enough bear the burden. 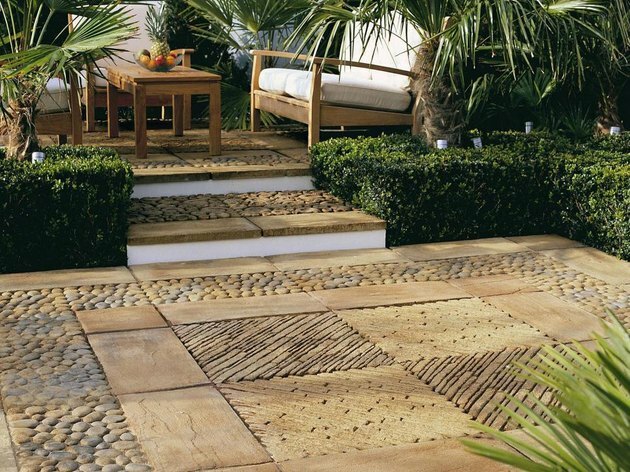 What's the difference between pavers and outdoor tiles? Let's just not go there. Can I Put Tile or Linoleum on My Wood Deck?